Liftoff is set for 11:51 UTC and the trusted Soyuz rocket will fire its three stages over the course of nine and a half minutes before handing off to the Fregat upper stage tasked with a pair of burns, spaced by a long coast phase, to put the satellites into a circular orbit for separation three hours and 48 minutes into the flight. 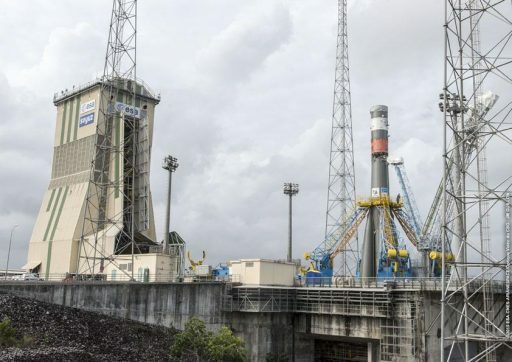 This is the 13th mission of the Soyuz rocket from French Guiana under operation of Arianespace and the third launch of the Russian booster from South America this year, all three having been dedicated to the European Galileo Satellite Navigation System. Managed by the European Commission, Galileo is being built at Europe’s civilian counterpart to the military-operated Global Positioning System of the United States, the Russian Glonass and the Chinese Beidou systems. 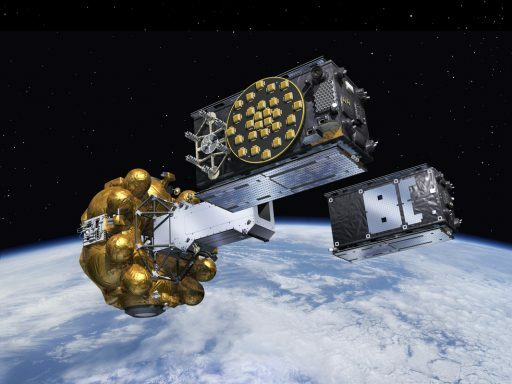 Pending a successful launch on Thursday, the constellation will consist of 12 satellites and, once the latest two additions are declared operational, the Galileo System will enter its initial operational capability, starting initial services and extensive testing. When complete by 2020, Galileo will consist of 30 satellites in three orbital planes. 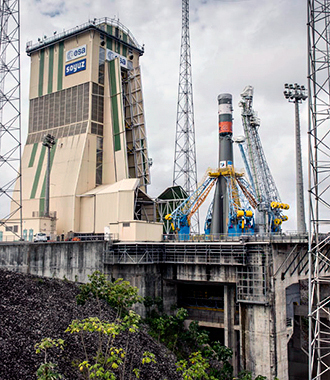 The current plan, after three Soyuz launches in 2015, calls for one Galileo launch in 2016 using the more-powerful Ariane 5 rocket to lift a group of four satellites. 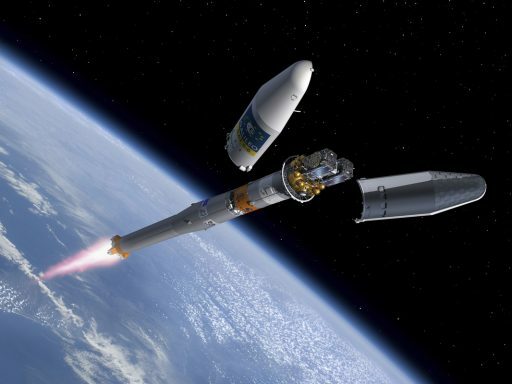 2017 would see two launches, one with Ariane 5 and one with Soyuz to bring the number of satellites up to 22. Galileo will achieve its fully operational capability with 24 active satellites. Each weighing 717 Kilograms at launch, the two Galileo satellites to head into orbit on Thursday were delivered to the Guiana Space Center in early November, being shipped from their manufacturer OHB in Bremen, Germany. Subsequently, the FM-8 and FM-9 satellites entered a processing campaign that included final checkouts and propellant loading before taking their side-by-side spots atop the Fregat Upper Stage which had undergone its preparations, including fueling, as part of its own processing campaign at the Spaceport’s Fregat Fueling Facility (FCube). FCube was specifically built to handle the Fregat Upper Stage and all its commodities that include Hydrazine Reaction Control System propellant and main propulsion system propellant components, Unsymmetrical Dimethylhydrazine and Nitrogen Tetroxide plus Helium pressurant gas. The facility consists of two areas, one for remote operation of fueling systems and preparations of processing personnel. 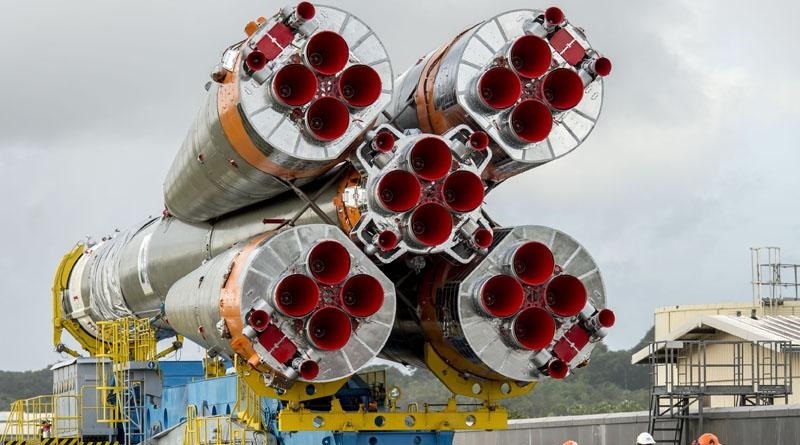 The Russian-built Soyuz rocket was assembled weeks in advance as its four boosters were mated to the large Core Stage of the rocket followed by the attachment of the modified Block I third stage. Flying in its 2-1B configuration, Soyuz uses the well-known design with four tapered boosters clustered around the core stage and a third stage sitting atop, but as part of the 2-1B configuration, the rocket introduced an upgraded third stage with a closed cycle engine and a significant change in the control system of the rocket, switching from and older analog system to fully digital flight control systems. 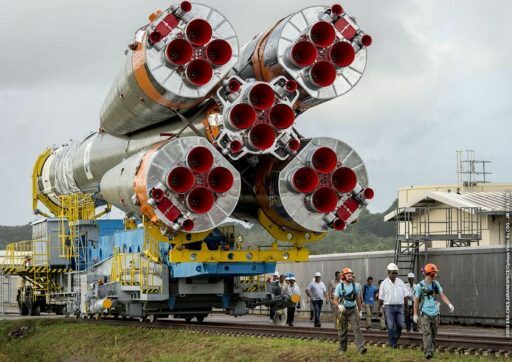 The Soyuz 2-1B rocket stands 46 meters tall and has a liftoff mass of 308 metric tons, including 272 tons of Liquid Oxygen and Kerosene propellants. It can lift up to 7,800 Kilograms into Low Earth Orbit and 1,645kg to Medium Earth Orbit, making it just powerful enough to launch a pair of Galileo satellites. 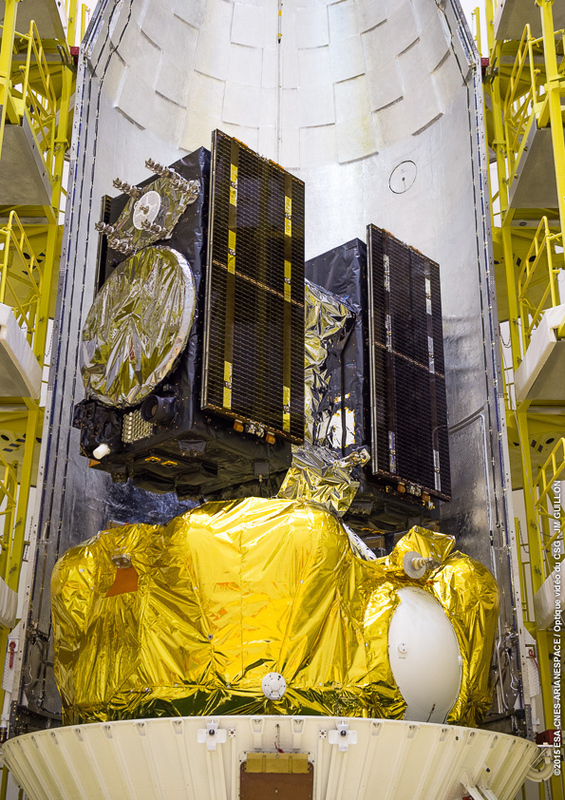 The Galileo satellites, encapsulated in the protective payload fairing along with their Fregat MT upper stage, were rolled to the pad later on Monday and hoisted up to be precisely positioned for installation atop the Soyuz. With structural and electrical connections in place, the assembled launch vehicle went through a countdown and launch simulation on Tuesday. Managers convened on Wednesday for the Launch Readiness Review that looked at the status of the launcher, the satellites, the tracking network and all other support stations to confirm everything was ready for the mission. No outstanding issues were found and Soyuz was cleared to head into countdown operations starting eight hours ahead of the planned liftoff time. The second Fregat burn is planned to commence three hours and 38 minutes into the flight and last four minutes and 22 seconds. 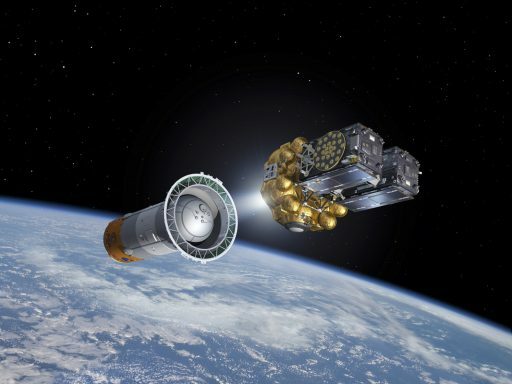 Galileo FM-8 and FM-9 are targeting an insertion orbit of 23,222 Kilometers at an inclination of 54.95 degrees. Spacecraft separation is planned at T+3 hours 47 minutes and 57 seconds as the two spacecraft are released simultaneously, being deployed into opposite directions to prevent a collision of the satellites.